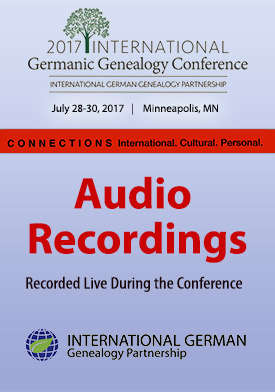 2017 International Germanic Genealogy Conference audio recordings. This package features audio recordings of all conference sessions listed below. 28805 F-109 Cyrillic Parish Records: A Guide to Documents Sigrid Pohl Perry, Ph.D.
28807 F-115 You Know Where, and You Know When; I'll Let You Know How They Lived Ingeborg Carpenter, M.A. 28819 SA-208 Die Pfalz: Understanding and Researching in Palatine Records Richard Haberstroh, Ph.D.
28826 SA-221 From Rural to Urban: Researching a Story of Mass Emigration from Northern Westpreußen to Buffalo, New York, U.S.A. Donald P. Schwert, Ph.D.
28832 SU-303 An Alsatian-American Case Study Richard Haberstroh, Ph.D.
28838 SU-314 1848er Democratic Revolutionaries and the German Mass Migration to the Midwest Yogi Reppmann, Ph.D.